"She may not look like much, but she’s got it where it counts, kid. I’ve made a lot of special modifications myself." Let the tinkering with new decks begin! 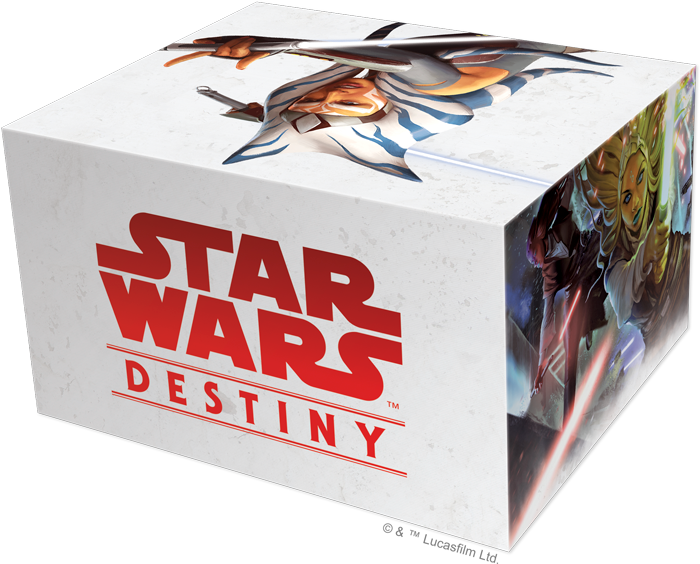 After the excitement of the Star Wars™: Destiny World Championships and Edwin Chen's victory, we're excited to see what new decks players might devise over the coming months and with the upcoming introduction of the Way of the Force Booster Packs. We expect to see player's trying their hand at Edwin's Kylo Ren and Anakin Skywwalker deck, and we expect to see players looking for ways to counter it. Most of all, we expect to see these decks blazing into action during the heated battles of the upcoming 2018 Star Wars: Destiny Store Championships. As the annual high-point of your local in-store Destiny gaming, the Store Championships take the competition you see during your regular Clash of Fates tournaments and amplify it—adding to the stakes with a shot at local bragging rights and an extended pool of exclusive prizes! What will you bring to your local Store Championships? Will you play with the top decks from the World Championships, or will you bring decks designed to surprise your opposition? The 2018 Store Championships are here, and now's the time to modify your decks. One of the greatest things about the Store Championships is that they don't just celebrate the top players. They reward everyone, and the Top 32 players at each 2018 Star Wars: Destiny Store Championship will receive not just one, but two prize cards—an alternate art Force Speed and an extended art, Aurebesh version of Tinkering. 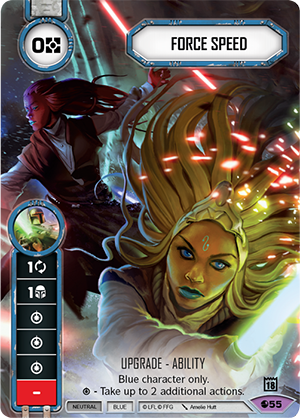 The alternate art Force Speed awarded to each of the Top 32 participants features artwork by artist Amelie Hutt that takes us back to a time when the Jedi figured more prominently in the galaxy's affairs. Instead of artwork that recalls Luke Skywalker's rescue of Han Solo from Jabba's Palace, this version recalls the offensive at Ringo Vinda that was led by the sisters Tiplar and Tiplee, both Jedi Masters. 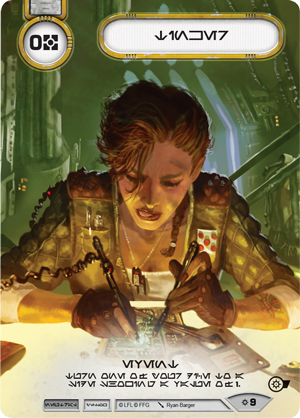 The extended art, Aurebesh version of Tinkering is the same as the card awarded at the Rivals Limited Event, although the misprinted cost has been corrected to reflect the card's actual resource cost of zero. If you hope to make the Top 8, you'll need to make the Force your ally—even if you aren't a Jedi or a Sith. Fortunately, you don't have to be a Jedi or a Sith to be strong with the Force, as was evidenced by the former Jedi Ahsoka Tano. After her personal trials led her to step away from the Jedi Order—but not from the light side of the Force—Ahsoka remained a powerful Force user and used her skills to help rally the fledgling Rebel Alliance. 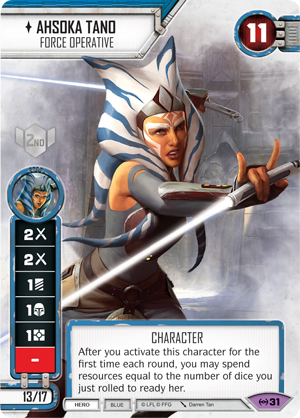 She also adorns the deck box you'll receive if you make the Top 8 at a 2018 Star Wars: Destiny Store Championship. If you like the new artwork for the Force Speed awarded to the Top 32, but you're not sure you're looking to include the card in a deck you'd rather build around red and yellow characters, then you'll want to be sure to fight your way into your Store Championship's Top 4 places. 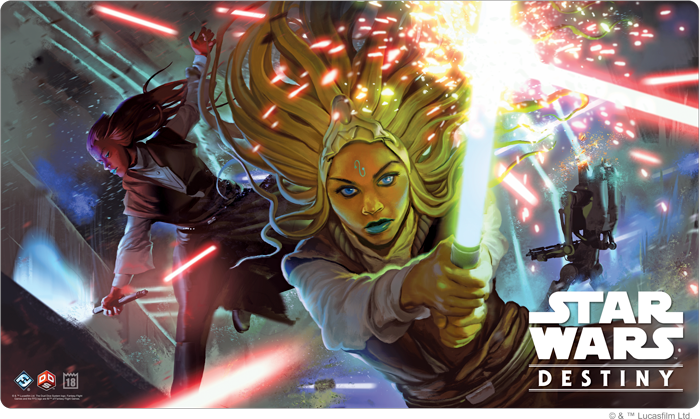 Each of the Top 4 participants at a 2018 Star Wars: Destiny Store Championship will receive a full-size playmat featuring the same image of Tiplar and Tiplee as shown on the Force Speed card. Not only does this playmat allow you to enjoy the dynamic colors and lines that Amelie Hutt uses to reflect the speed of the Jedi's movements, but it allows you to start with the artwork in play and at full size. You don't have to draw it, and it won't be cut off at the edge of the card. Instead, you get the whole piece—complete with deflected blaster fire and headless battle droids! Rise to the occasion, battle your way into the Top 2 at your Store Championship, and you'll have proven yourself strong with the Force. For your efforts, you'll be rewarded with a plastic, spot-glossed Ahsoka Tano card—foil-stamped to commemorate your place in the event, either 1st or 2nd. Not only does this card celebrate your achievement by spot-glossing the galaxy's most famous Togruta, but it dampens the impact of the surrounding scenery and features a grey-scale reverse side that helps you better mourn Ahsoka's loss should you ever lose her… Of course, if you've just made the Top 2, the chances are you won't lose Ahsoka very often. 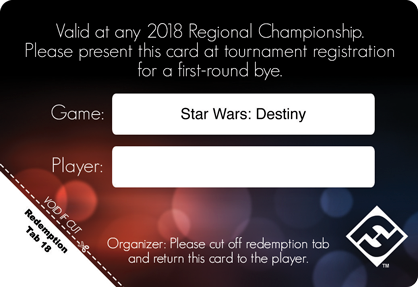 Each 2018 Star Wars: Destiny Store Champion wins a Prize Bye worth a first round victory at a 2018 Star Wars: Destiny Regional Championship. The 2018 Star Wars: Destiny Store Championships are here, and that means a time of trial. You'll face conflict. You'll be tested by the dark side. And you'll have a shot at some of the coolest prizes you'll see in your favorite local gaming store this year. Are you ready for the coming challenges? 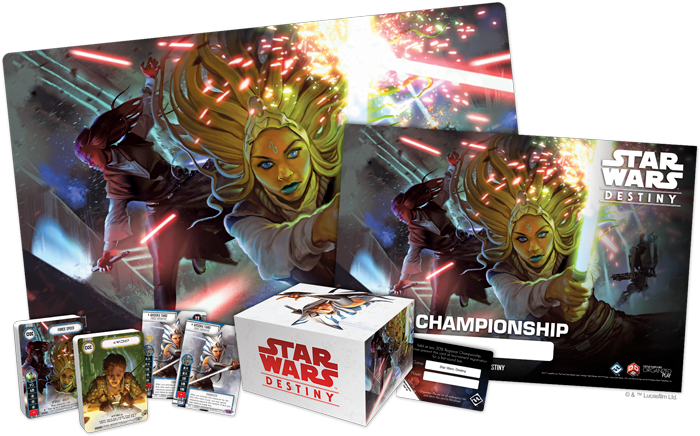 Talk to your local retailer today to find out when they'll be running their 2018 Star Wars: Destiny Store Championship! Note: This article originally miscredited Tiziano Baracchi for the artwork on the alternate art Force Speed and playmat. He is also mistakenly credited on the card itself. The artwork was actually provided by Amelie Hutt.